No matter who you are or what your business does, it’s just about impossible to avoid seeing negative feedback. And that’s OK because as many grumps there are wanting to push negative sentiment at your brand, there’s just as many speaking positively about you. However, without some form of social media reputation management, how do you even know what people are saying? Word-of-mouth marketing should be taken very seriously. BrightLocal discovered 88% of consumers trust written online reviews from customers just as much as they trust their own peer recommendations. That should make the hair stand up on every brand marketer’s arm. It’s so easy to have one negative review, response or social media message leave a bad taste in everyone’s mouth who sees it. This is why so many businesses put their resources in social media monitoring tools to never miss a message–good or bad. Here at Sprout Social, we offer in-depth social media monitoring tools for brands to manage reputation, respond to questions or concerns and track social users who consistently mention your brand name. Sprout is a great tool to track misspellings of your brands name, mentions without being tagged and conversations about important keywords within your industry. But before we get too in-depth about the tools you can use to better manage your online reputation, we need to discuss what defines social media reputation management. It’s important to be credible not just on review sites, but on all social media channels. A survey from SDL found 58% of consumers tend to share their positive brand experiences on social media platforms. Not only do consumers share their experiences on social media, but their audiences trust them more than you. BrightLocal discovered 72% of consumers will trust a brand more-so after reading a positive customer review whether it’s on social media or a review site. You have to be on top of all the social conversations happening around your brand. An important question to ask before starting is do you know what you need to monitor to improve your online reputation? If not, that’s fine because many brands don’t know what to look for besides the messages coming directly to them. Your company name: First and foremost, your company name is what defines you. But maybe everyone isn’t quite familiar. For example, the Chicago brewery Half Acre would want to monitor other company name keywords like Half Acer, Acre Beer or HalfAcre. Make sure you have all common misspellings so you leave no room for error. Your company’s products or services: Just like your name, your products and services need to be monitored too. In the same example, Half Acre’s most popular beer is The Daisy Cutter. You’d want to track keywords like “daisy cutter” and “dasy cutter” because many people might mention your product, but not your brand name. High-profile employees: Do you have anyone who stands out as a high-profile employee? You want to track their names as well. Brands such as Moz might track Rand Fishkin or Quick Sprout with Neil Patel. Popular industry keywords: Keeping track of how and what people are saying in your industry is critical. For the same example, Half Acre would want to track industry keywords like Chicago brewery, craft beer, Chicago microbrews or best Chicago beers. Your biggest competitors: Competitor analysis can provide great data into how you stack up against others in your industry. 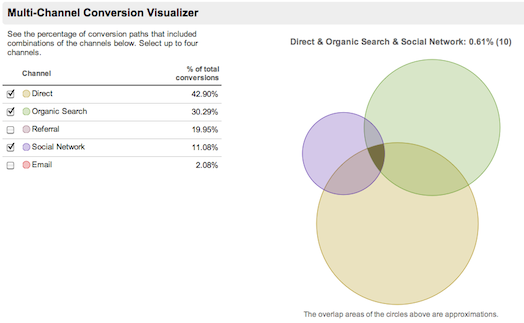 Track your competitors’ names to see what others are saying on social. If you read the section above and were wondering how in the heck are you going to track all those keywords on your social channels–don’t worry, we’ve got you. Sprout Social’s social media monitoring tools make it absolutely easy to not only track keywords across platforms like Twitter, Instagram and Facebook, but also have all the messages in a single-stream inbox. While there are numerous tools out there that can track your social media mentions, Sprout goes above and beyond with message tagging so you can send specific social media messages to technical support, customer support, marketing or even your sales team. Connecting to Sprout Social streamlines your workflow with the Smart Inbox so you don’t have to log in and out of multiple tools. Keep all of your hashtag, keyword and brand mentions data in one place, all while responding and replying to customers within the platform. 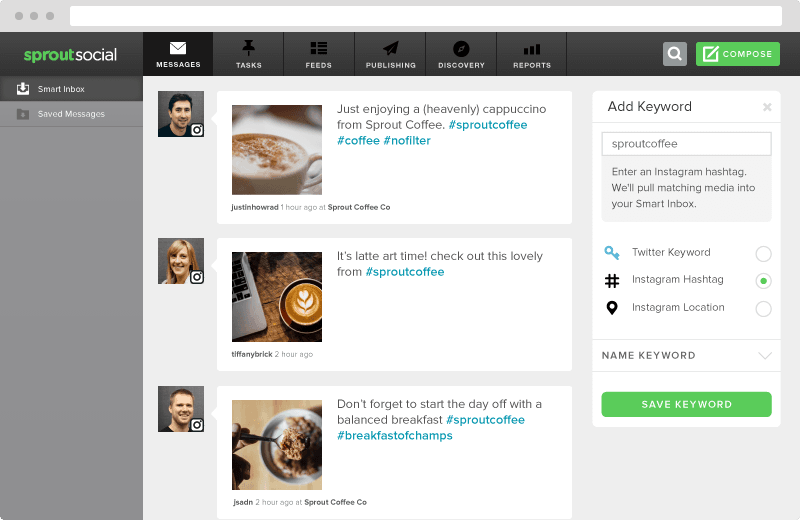 See Sprout Social in action today and request a demo to see what it’s like to track your most valuable keywords. Doing so will help broaden your picture of what true social media reputation management looks like. To truly engage with your customers, you have to listen to what they say. Social media engagement is a two way street, so make sure you’re listening to help build better customer trust and loyalty. Social media continues to grow as the No. 1 resource for customer care. 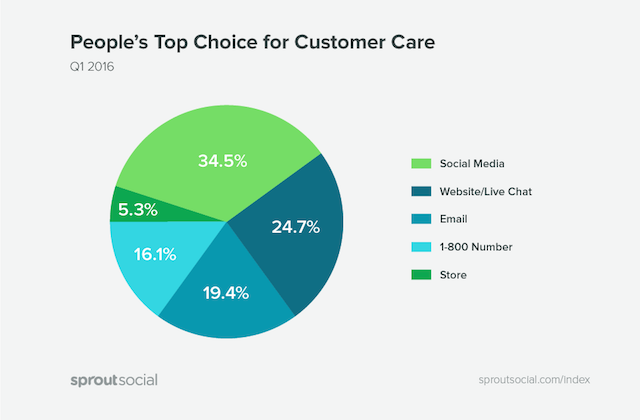 In fact, our Sprout Social Q2 2016 Index found the most popular avenue people take for customer care is social media (34.5%). What happened to 1-800 numbers? It turns out only 16.1% of people prefer 1-800 numbers as the main source for customer care help. Essentially this means your brand receives a lot more messages than before. To manage your social media reputation, it’s critical to respond to everyone reaching out. Customers expect a response from a brand within four hours, but the average company response on social is 10 hours. It’s easy to say “respond to all queries” when they’re nice or pleasant messages. But let’s be real–there are a lot of negative messages on social and it’s easy for people to target businesses. What you have to do is know how to respond to upset customers, Twitter trolls and everything in between. To strengthen your engagement, always try to give transparency and appear as humanistic as possible. People feel better and trust your brand more when they know someone is taking the effort to resolve their issue (instead of an automated message). Even the negative answers need a response. If someone is posting a bad experience, try to provide clarity or a resolution to the problem. However, if the person continues to act aggressive, give them a route to voice their opinion and essentially, kill them with kindness in the process. These steps will help make cool heads prevail. Your job as a brand on social media is to not be afraid or avoid angry social messages. By encouraging more social media reviews, you have the chance to increase your reputation (especially if it’s limited or in a bad spot). Try to provide the easiest route possible to your most sought-after review sites. Clickable images, links in posts and specific images that have calls to action requesting reviews all work well. At the same time, you want to monitor and engage with the reviews coming in on your most important review sites. This will help lower negative reviews and give your audience a better picture of how you handle customer complaints. Positive engagement always increases the trustworthiness of customers. Talk to your email marketing or customer service team to see how you’re offering reviews within online receipts or post-purchase emails. Even though some businesses really don’t like asking too much of their customers, it’s still important to encourage them to rank or review your brand. If you don’t ask, you’re not going to get as many reviews. But we understand that a confirmation, receipt, delivery status and arrival email can be too much. Instead, connect with customers through social media. 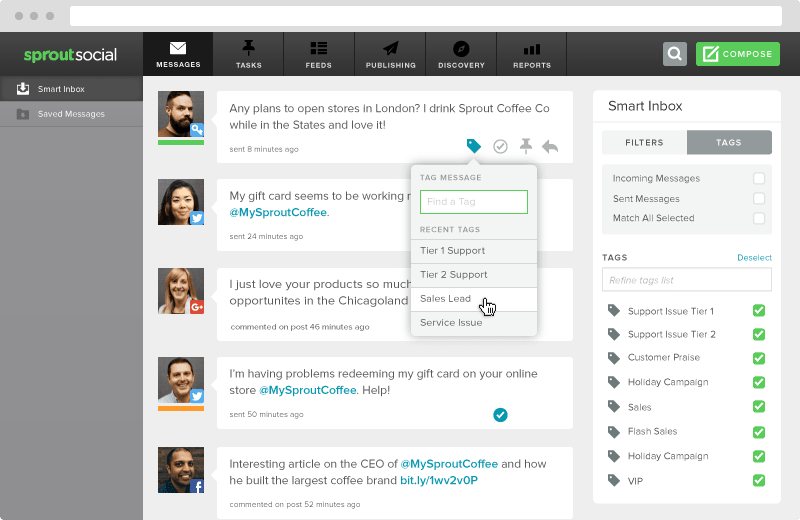 Monitoring tools from Sprout Social give you the chance to listen and monitor all conversations around your brand. While we provided some keywords around your brand earlier, take the extra step and add things some of your customers might be saying. Search for positive sentiments and respond with thankful messages. Then you can encourage your happy customers to leave reviews. More likely than not, if they had a good experience, they’ll be willing to leave a good review. For the marketing managers out there, here’s where we get to the good stuff. Maintaining a positive social media reputation can lead to a better return on investment. Investing in social media management tools can quickly pay off when you see positive reviews and conversations pouring in on social. Track your sales from word-of-mouth marketing and social media referrals. Then calculate your customer acquisition costs from these channels. Also note how many positive reviews you have. Once you implement your social media monitoring tools, you can track new positive reviews and do a comparison over a three to six month or year-long period. For more insights, Convince and Convert shows how you can track this information in your Google Analytics Social Reports. Through these data pulls, you’ll have a much clearer understanding of how your social media traffic affects your site. Test your social media content revolving around reputation management to see if it’s driving people to your site or a review site. Eventually you’ll have enough information to see how your referral, social media and site traffic lead to customers. Through comparative analysis, you can measure your new reputation management efforts and watch the cost acquisition costs dwindle. It’s smart to set some goals for your social media reputation management strategy. While each business is unique, brands can all see success with engaged customers, more attention to positive reviews and social media traffic tracking. Feel free to share your experiences or tips in the comments below!